Missed or Misdiagnosis: When a doctor fails to recognize the signs and symptoms of a serious condition and then does not make a proper diagnosis, the missed diagnosis allows the illness or condition to get worse because the appropriate course of treatment is not initiated. Similarly, when a doctor makes a misdiagnosis, the wrong treatment is administered to the patient, which can be bad for the patient in its own right and enable the illness or condition to get worse. Surgical Errors: Sometimes a surgeon makes a mistake during surgery. It could be that there was a miscommunication about what type of surgical procedure the patient needs, or that the surgeon did not exercise reasonable care while performing the procedure, but countless patients are seriously harmed each year by doctors who make surgical errors. Prescription Errors: When patients are prescribed the wrong medication or the incorrect dosage, they can get hurt. Whether the doctor’s handwriting was illegible, or the doctor made a mistake when prescribing a particular drug, dosage, or administration instructions, medication errors have formed the basis of many medical malpractice claims. Patients can also be harmed if the doctor prescribed a drug but failed to realize that the patient could suffer a serious drug interaction. When a patient takes the wrong drug, it could have a serious health impact on a patient, just as taking the incorrect dosage or an improper administration route can be harmful to the patient. Injured patients are victims of medical negligence. These patients need to act quickly in order to protect and preserve their rights. There is a short statutory time limit on filing a personal injury claim based on medical malpractice, so injured patients need to speak with an experienced personal injury lawyer as soon as possible about their situation. You do not want to miss out on justice because you waited too long to bring a medical malpractice claim against the health care provider who harmed you. 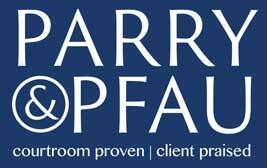 If you have been injured by a healthcare provider, you should contact the professionals at Parry & Pfau to discuss your circumstances. Let us schedule a free consultation with you today. Older PostWhat Kinds of Medical Evidence Might Be Used in My Car Accident Case?